I’m kind of breaking my own rules with this post, but let me explain. The contest is hosted by Sucré, an amazing confectionary here in New Orleans. They specialize in macarons, but have a million other amazing sweets and things. Sucré challenged 13 bloggers to come up with their own unique flavor of macaron and have opened up the voting to the public. Check out the other submissions and vote for your favorite here. The macaron shell recipe is adapted from Martha Stewart and the Marshmallow Creme is from Chow.com. 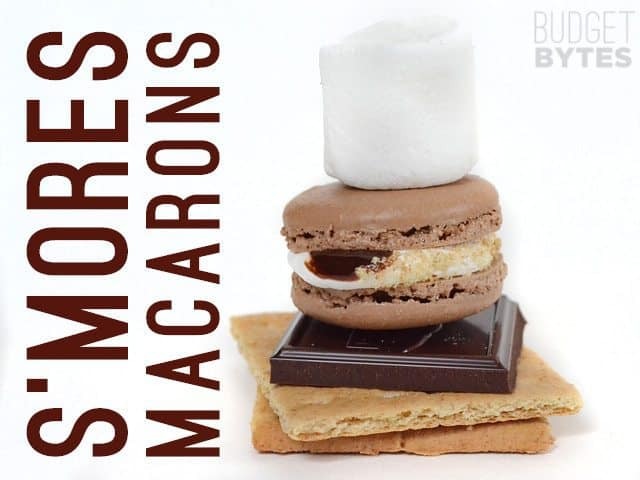 These fun and flavorful Smores Macarons are a baking challenge, but worth every bit of effort. Get the full tutorial here. Begin by making the marshmallow cream. In a glass or metal bowl, whisk together the egg whites, granulated sugar, cream of tartar, and a pinch of salt until well combined. Place about 1 inch of water in a small sauce pot and bring it to a boil. Place the bowl with the egg white mixture over the boiling water and whisk by hand for 6 minutes. 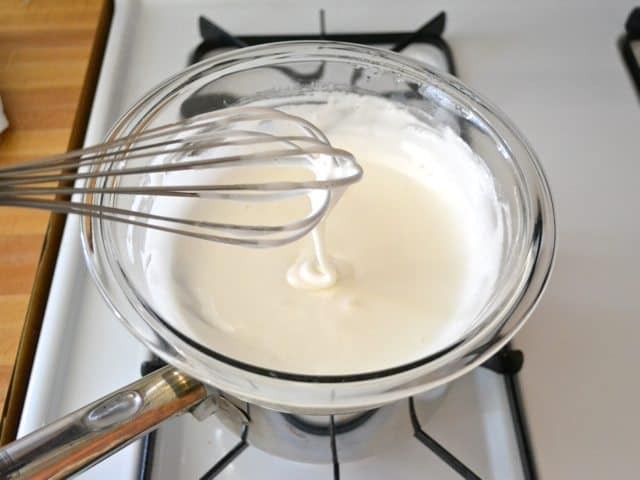 Remove the bowl from the heat, add the vanilla, and use a hand mixer or stand mixer to whip the egg white mixture to glossy peaks (about 5 minutes). Refrigerate until ready to use. Next, begin the macaron shells. 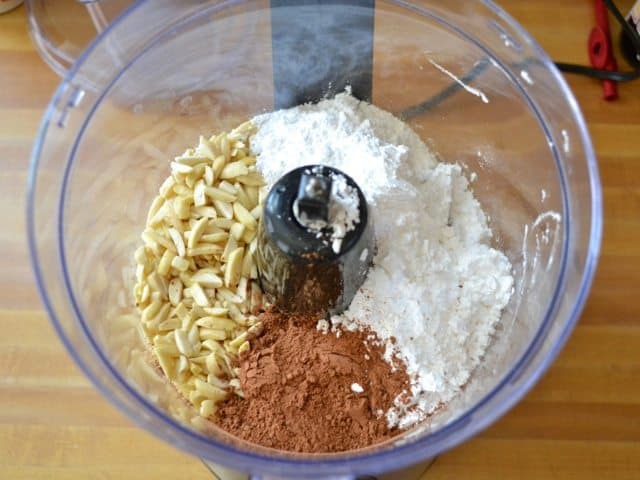 Place the almonds, powdered sugar, and cocoa powder in a food processor. Process the mixture until it is a super fine powder. Sift the mixture through a wire sieve into a bowl. In a separate bowl (glass or metal) combine the egg whites, sugar, and cream of tartar. Stir or whisk together until combined, then use a hand mixer or stand mixer to whip the whites into stiff, glossy peaks (about 5 minutes). 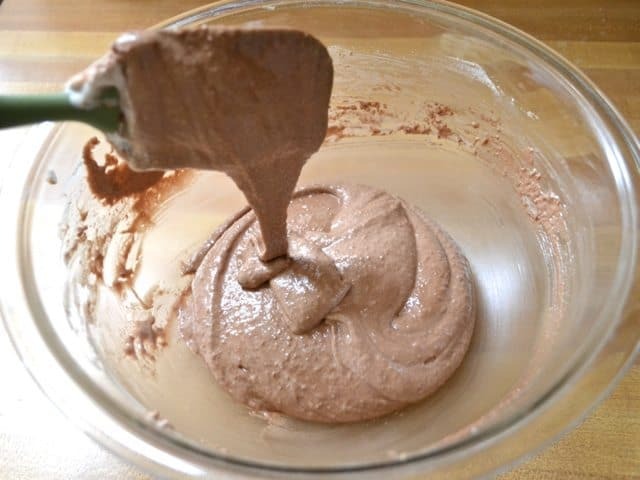 Fold about 1/3 of the cocoa almond mixture at a time into the whipped egg whites until no dry powder remains. After all of the dry mixture has been folded in, the mixture should have the consistency of thick, hot lava. Cover two baking sheets with parchment paper. 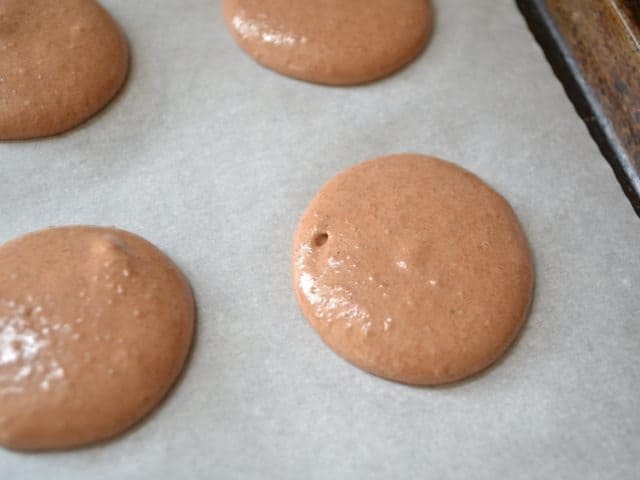 Use a pastry bag to pipe the macaron mixture into 1.5 inch rounds on the parchment paper. 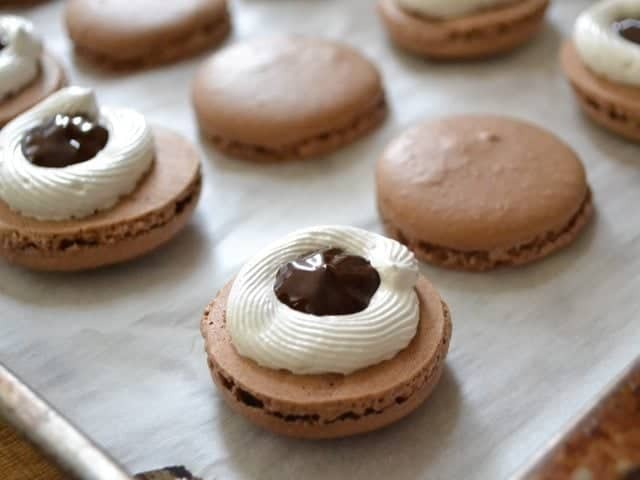 Leave enough space for the macarons to spread slightly without touching. 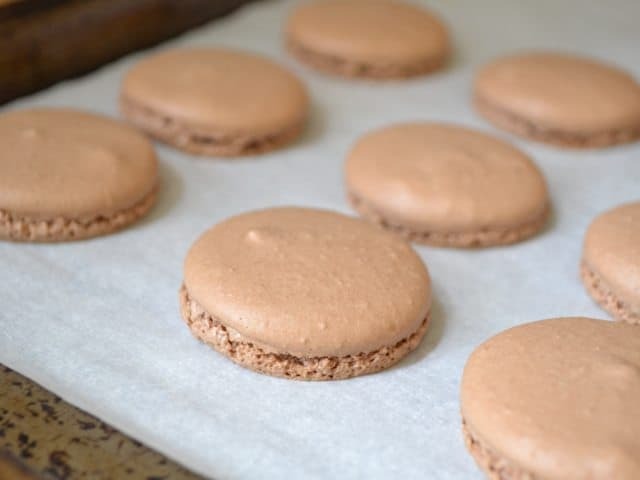 After piping all of the macarons onto the sheet, slam the baking sheet on a counter a few times to force any larger air bubbles to the surface. Let the cookies sit out at room temperature for about 30 minutes so that the surface dries slightly (this helps form a "foot" or ruffle on the bottom of the macaron). Preheat the oven to 350 degrees. After 30 minutes of sitting, the macarons should have a dull, less glossy appearance. Bake one sheet at a time for 13 minutes each. Allow the macarons to cool to room temperature before removing from the parchment. 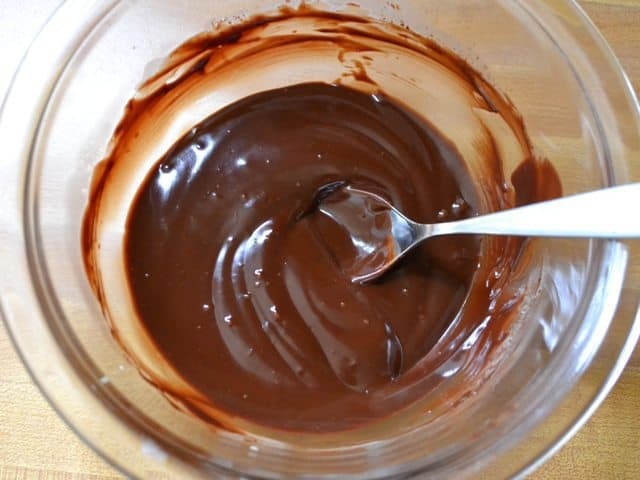 To make the ganache, break up the chocolate into small pieces and place in a microwave safe bowl. Add the heavy cream. Microwave on high for 15 seconds, then stir well. 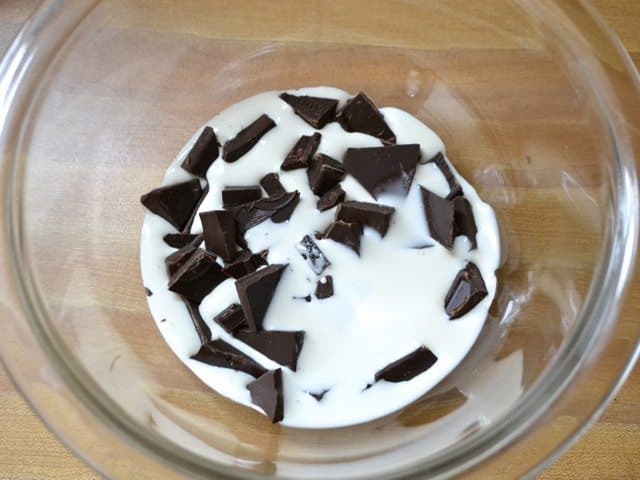 Microwave for 15 seconds once more, then stir until the chocolate is completely melted and has created a smooth mixture with the cream. Let cool. 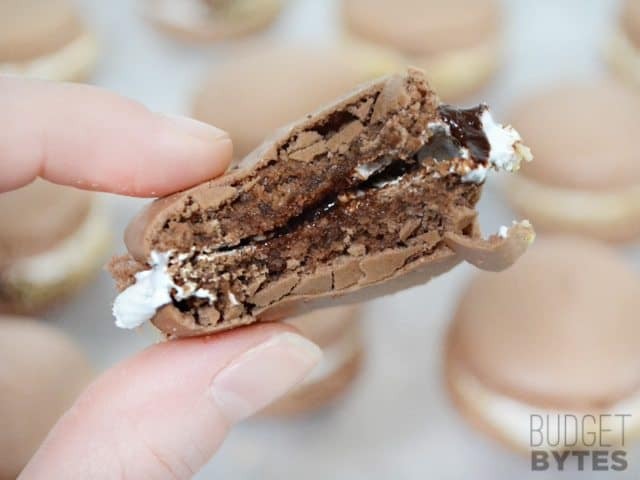 Fill a pastry bag with the marshmallow creme and a second bag with the chocolate ganache. Flip half of the macarons over and pipe a circle of marshmallow creme around the outside edge of the bottom. Fill the center of the marshmallow creme circle with ganache, then place a second macaron shell on top and press down slightly. 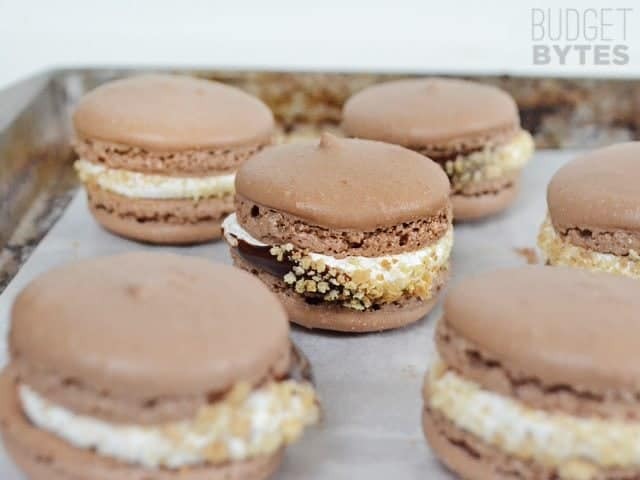 Dip the filled macarons in the crushed graham crackers to make it stick to the marshmallow creme. 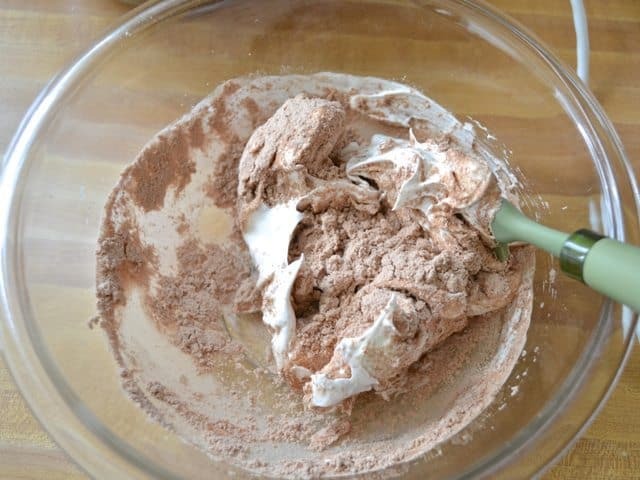 Tip: Dip soon after filling as the marshmallow dries a bit and gets less tacky as it sits. I began with the marshmallow creme, so that it would have time to cool and “set” in the refrigerator. 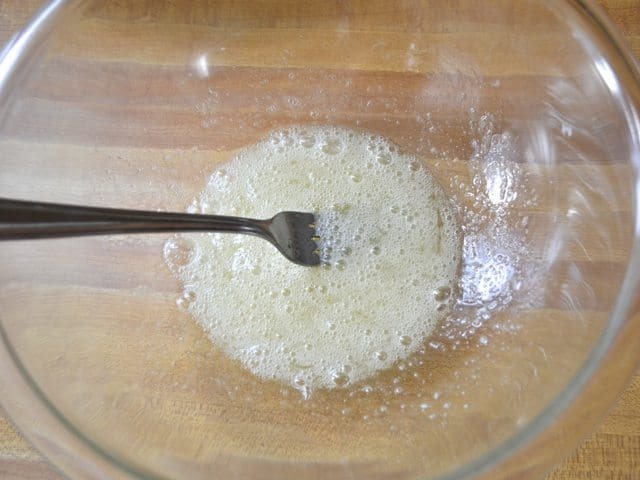 In a glass or metal bowl, whisk together two egg whites, 1/2 cup granulated sugar, 1/8 tsp cream of tartar, and a pinch of salt until it is all combined. 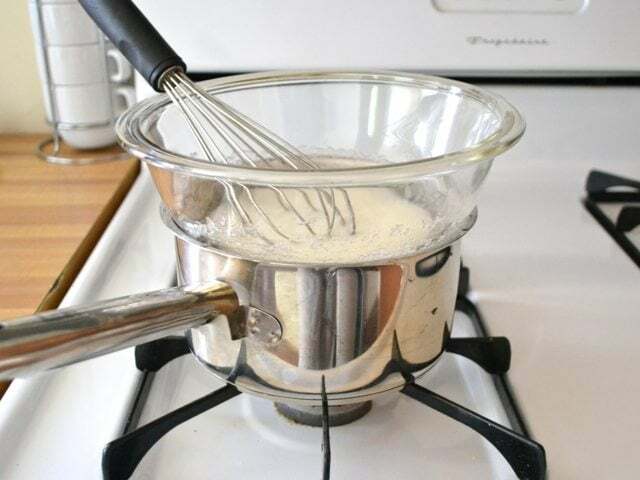 Create a double boiler by bringing about 1 inch of water to a boil in a small sauce pot. Place the bowl with the egg white mixture on top, and whisk the mixture over the heat for 6 minutes. This melts the sugar without cooking the egg whites, which will create the unique marshmallow texture. 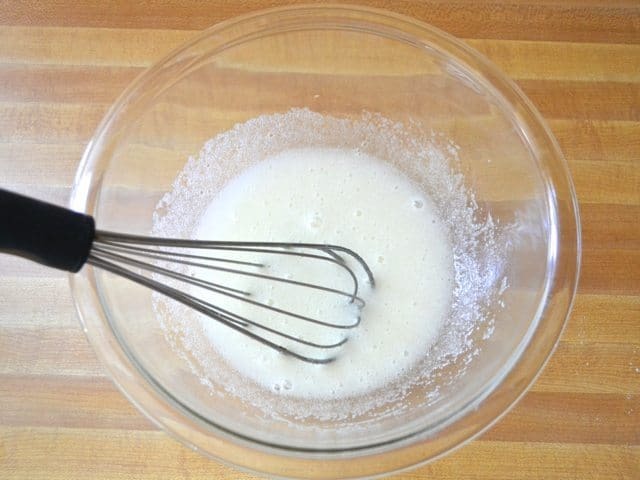 You don’t have to whisk vigorously, just make sure you’re stirring it the whole time with the whisk. After 6 minutes it will look kind of creamy like this. Now add 1/4 tsp of vanilla and use a hand mixer or stand mixer to whip the mixture until it forms glossy peaks (about 5 minutes). The creme will be pretty soft and gooey still, but it will stiffen up as it cools. Cover it and refrigerate to cool it faster. 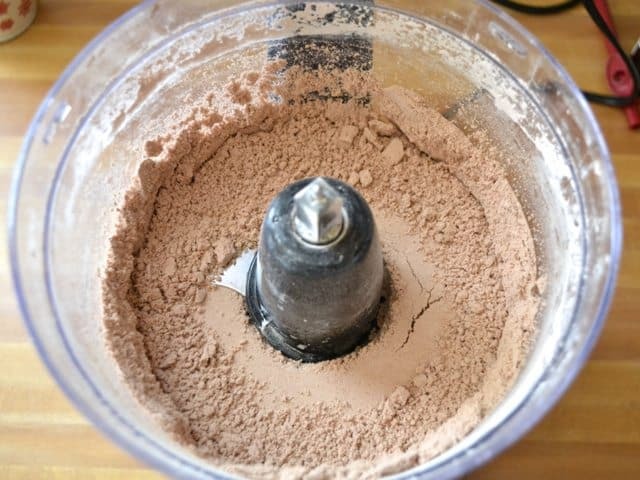 Now on to the macaron shells… Place 2/3 cup slivered almonds, 1 cup powdered sugar, and 2 Tbsp cocoa powder in a food processor. Process until it is a fine powder. You really want this mixture to be as fine as possible or else your macarons will be all bumpy and lumpy. You can pinch some of the powder between your fingers to see if you feel any granules. Process a little more, if needed. Then sift the mixture into a bowl to remove any larger pieces. I thought I had mine pretty smooth, but I still had quite a few granules. Discard those large granules. In a separate glass or metal bowl, stir together two egg whites, 1/4 cup of sugar, and 1/8 tsp cream of tartar until well mixed. 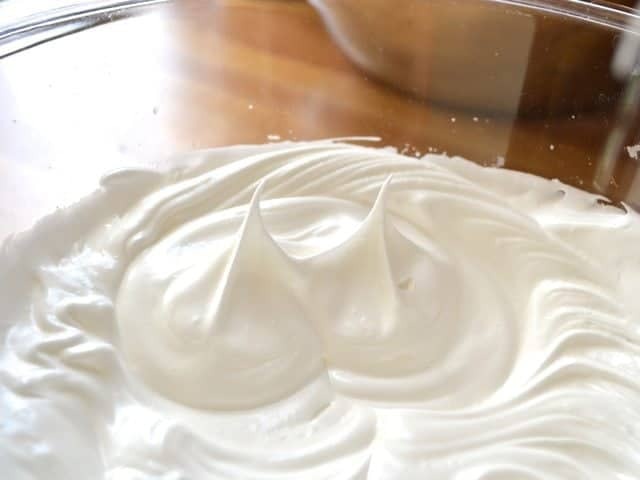 Then use a hand mixer or stand mixer to whip the egg whites up into stiff, glossy peaks. You’ll know the peaks are “stiff” when you pull out the beaters and the peaks stand straight up without flopping over. When you start to get close to this point, check the peaks a few times to make sure you don’t go too far. If you over beat the whole mixture will break down and separate. When it’s all folded in it will have the same texture as thick, hot lava. When you lift some up with your spatula, you want it to run back into the bowl SLOWLY. Kind of like thick cake batter. If it’s running like liquid, it’s over mixed. 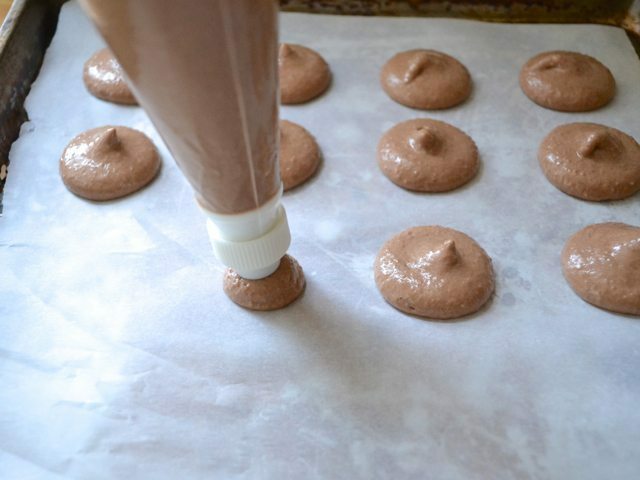 Fill a pastry bag with a plain, round tip with the macaron batter. 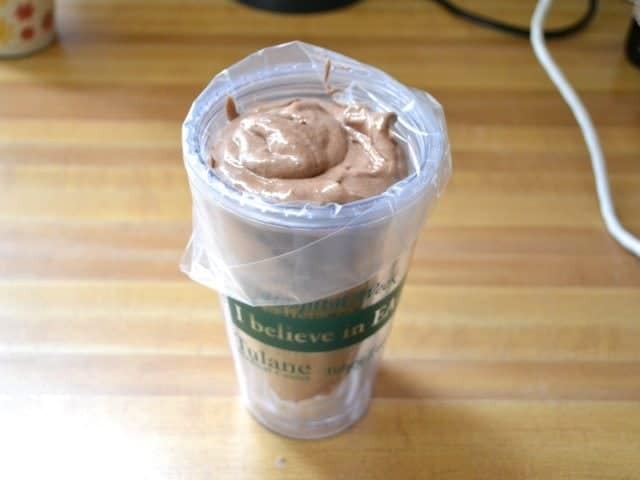 The easiest way to fill the bag is to place it in some sort of tall cup and fold the bag over the edges, like this. Cover two baking sheets with parchment and pipe the macaron batter into 1.5 inch circles on the parchment. Be sure to leave enough room for them to spread a little. Hold the pastry bag straight up at 90 degrees from the sheet and squeeze the batter out, without lifting the tip up. If you keep the tip fairly close to the baking sheet as you squeeze, the batter will extend out in an almost perfect circle. Pretty cool. After you’ve piped all of the batter onto the baking sheets, slam the baking sheets down on the counter a few times to force any large air bubbles out the top (see the one that popped out of the side there?). This also helps flatten the little peaks left behind by the pastry tip. Now, let the macarons sit out at room temperature for about 30 minutes so they can dry out a bit. Towards the end of the 30 minute resting period, preheat the oven to 350 degrees. Once it’s heated, bake one sheet of macarons at a time for 13 minutes each. As they bake they will want to expand, but since the top has dried out and become stiff, they can only expand up and therefore create that classic ruffle or “foot”. Let the macarons cool to room temperature before removing them from the parchment. And you have a super smooth ganache, like this! Now, let that cool for a minute. Crush your graham crackers into a super fine powder, like this. You really don’t need a lot. Just a few crackers (I crushed far too many). Fill a pastry bag with the marshmallow creme and another bag with the ganache. 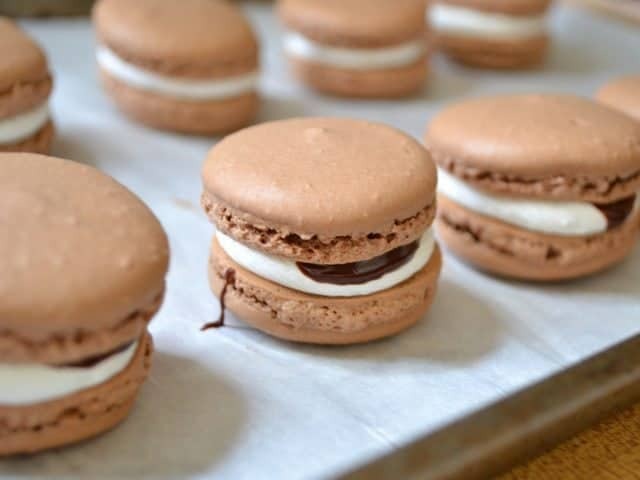 Flip half of the macarons over and pipe a circle of marshmallow creme around the bottom. 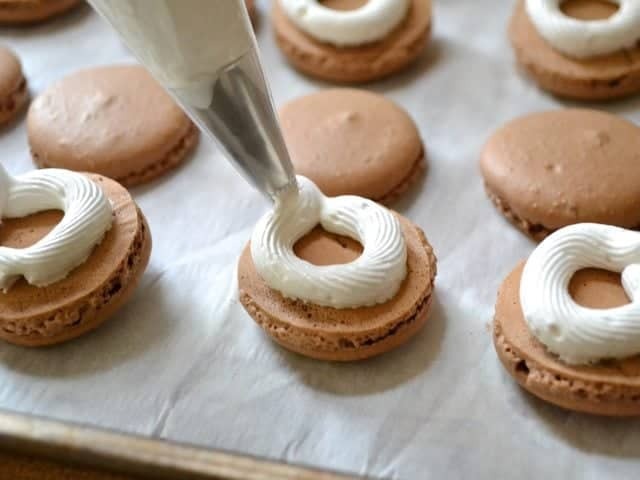 Don’t pipe all the way at the edge, though, because it will spread out as you add the top macaron shell. Then add the top macaron shell and press down a little to make the filling go all the way to the edge. Some of the ganache will likely squeeze out of its “fence”. 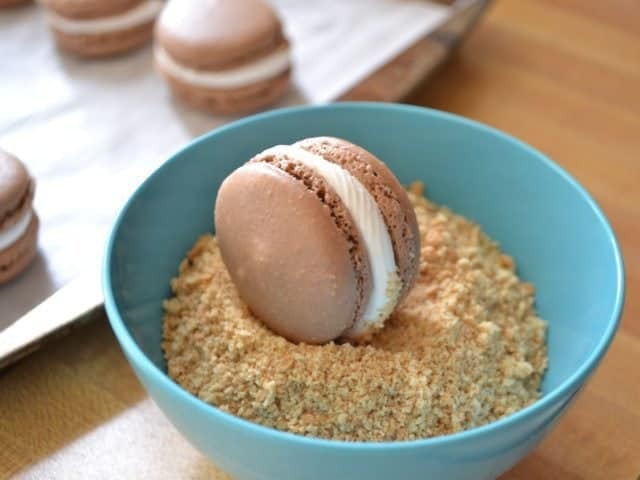 Dip the macarons in the crushed graham crackers to make it stick to the marshmallow. Try to dip them right away, though, because the marshmallow dries a little and becomes less tacky as it sites. You can coat the entire circumference or just do half for a nice visual effect. 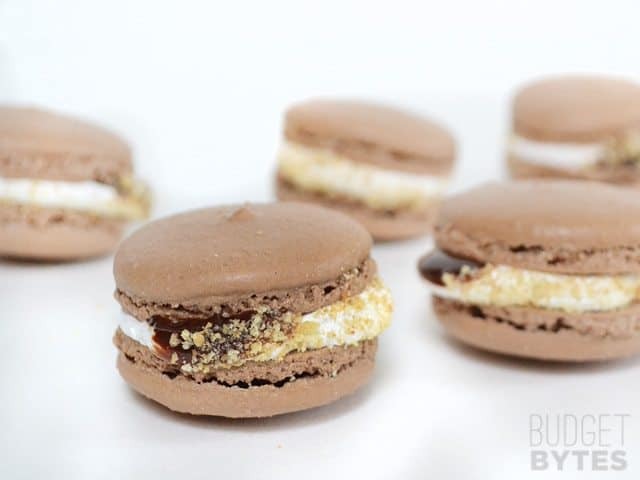 And that’s how you make a S’mores Macaron! A little involved, but really, really fun! Don’t want to bother? Sucré ships their goods, so check out their online shop! 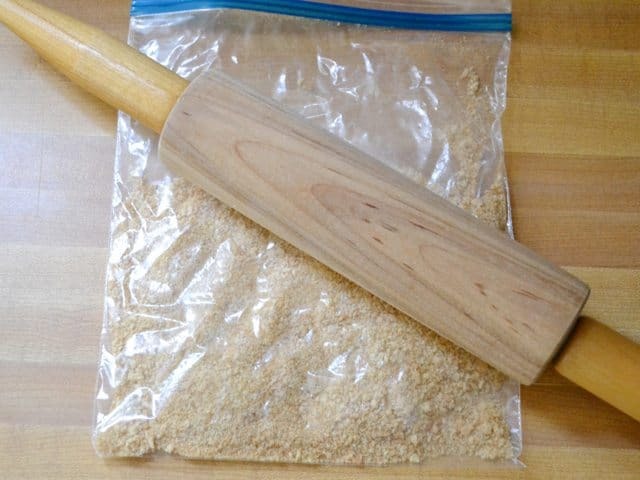 If I wanted to follow this recipe but use almond flour rather than grinding almonds, what would be the amount to use and would it affect the end result? Honestly I’m not sure what the equivalent volume of almond flour would be. 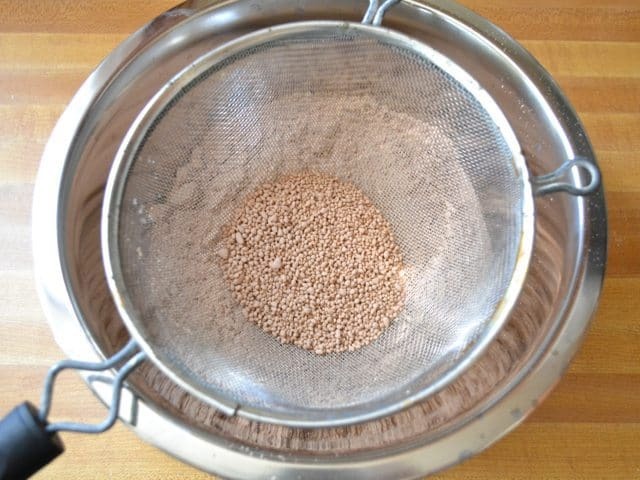 It may also vary, depending on how finely ground the almond flour is as well. I haven’t worked much with almond flour in the past, but with what little I have, I have noticed that not all brands are the same texture. So that is one problem you may come into with using pre-ground almond flour. If it is not fine enough, the macarons won’t have the correct texture. I’m not sure if this is a silly question, but would you be able to use a blender to make the super fine powder for the shells? I don’t currently own a food processor and I’m not able to afford one right now, even a cheap one. I do however have a blender and would be willing to try to make it work instead. Thanks for the recipe for marshmallow creme, Beth. I make a cheesecake adapted from an old 1976 Betty Crocker recipe (from the very first cookbook I ever owned) that used Betty Crocker’s fluffy white frosting mix. If they make it anymore, I’m at a loss to find it anywhere locally. So being an obsessive label reader, I remembered the ingredients. I theorized that marshmallow fluff would be a good substitute, and my experiment proved true to the theory. Fluff is tough to find. Sometimes it with the peanut butter; other stores stock it with baking supplies. Sometimes its placement seems totally random to me. Anyway, it’s a lot more expensive than your recipe. I don’t like an overly sweet cheesecake, preferring to let the tang of the Neufchâtel come through, so the sweetening in the fluff is all the sugar I use. I may even undertake the macarons someday, but I have to admit they intimidate me. I’ve never had one, so have no model, and there’s a very long thread on the eGullet food forum about troubleshooting them. 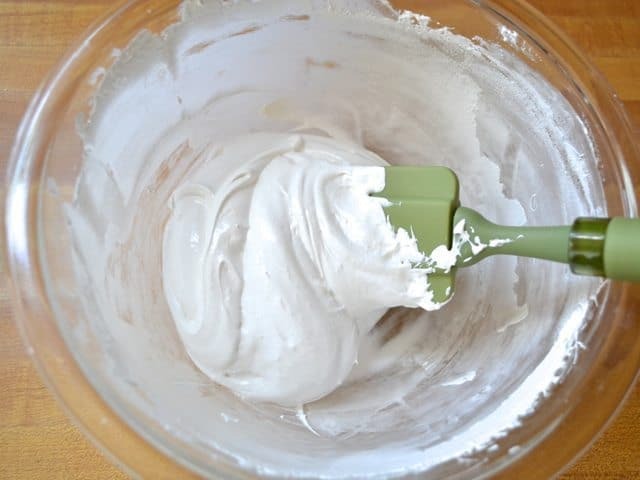 I’m definitely making this marshmallow creme component next time I go for cheesecake, after I use up the 1/2 tub of commercial stuff I still have. I have to admit, though, this marshmallow fluff does not hold up quite as well as the store bought (they may use some sort of stabilizer?). After a couple days in the fridge it begins to deflate a little. I read that part about the deflation, but I think after baking, it may not be an issue. I’ll also use the leftover yolks in the recipe. I think after the bake, it’ll set the egg and cheese. It certainly seems worth a try to save some money, and let me make just the amount I need. The ingredients on the leftover tub I purchased at the dollar store are: corn syrup, sugar, dried egg white, vanillin. At least it isn’t high fructose corn syrup, and I could do without the fake vanilla. Maybe the dried egg whites contribute to the stability, removing the water content of the eggs. I believe the cheesecake will lose a bunch of moisture from evaporation during baking. Anyway, I’m giving it a try, and I’ll let you know how it works. It may be a while because I have to limit my calorie dense intake. Thank you so much for your content rich site.